Welcome to our School of Living electronic newsletter where you can catch up on what is happening in our land trust communities and SOL committee work. We have six communities living on 6 parcels in our Community Land Trust. The School of Living is a Community which includes the Trustees, Officers, employees and membership. Membership is an opportunity to steward land and communities seeking knowledge, skills and processes by which we live in harmony with the living creatures that sustain our opportunities for survival. The School of Living land trust communities are, already, getting started in this season’s gardening ventures. Seeds such as onion, celery, parsley, and brassicas are getting started indoors with protection, light, and warmth. It is also time to pre-sprout ginger and turmeric. This was the second year that several of our communities came together for a group order from Hawaiian Clean Seed (aka Biker Dude) for ginger and turmeric. This gives us great bulk pricing as well as opportunities for sharing experiences and strategies. Here is a School of Living blogpost about growing ginger and turmeric. This year, Tightshift Laboring Cooperative joined us in the growing experiment. Ahimsa Community and StellaLou Farm continue to grow for their homesteads. 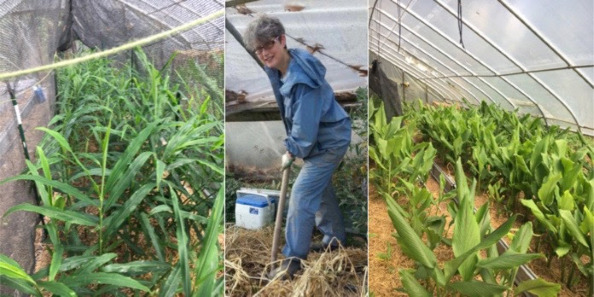 Heathcote Community grows larger crops of ginger and turmeric in the hoophouse for their harvest-your-own market. School of Living is always looking for more ways to collaborate with and support our communities in becoming more self-reliant in growing food and medicine. In the article, she shares examples of actions that demonstrate her own commitment to community and social justice. She speaks of the School of Living Board which looks to communicate and build authentic support for the creation of communities that have a commitment to Social Justice. ​”Please share in this space what members of your community are doing to steward the land and communities in which you live. Additionally, how can the work of the SOL Board best serve your community?” If you have something that you’d like to share in our newsletter or if you would like to communicate with a School of Living board member, please contact us. Thank you, Brenda! This is a SAVE THE DATE! announcement for the next quarterly meeting of the School Of Living Board Of Trustees and the annual meeting of the School Of Living General Membership. Members will elect board members, officers and approve new memberships. Please put this date on your calendar and plan to join us for a variety of SOL business, fun, learning, and human connection. For questions or more information: Contact us! Grandma Gatewood’s Walk (By Ben Montgomery, published 2016) sparked June Yeatmans attention, being a great grandmother herself. Enjoy her review of the book! This enchanting and inspiring story is about Emma Gatewood who read an article about the Appalachian Trail in a National Geographic magazine. She planned for a long while to try walking on the trail. She was, at 69 years, a great grandmother, with 11 children and also an abusive husband. She often took long walks, the family were accustomed to her ways. One day she left a note in the house saying “Gone shopping and then going for a walk”. Seems she had a great sense of humor. She took a train, and plane and lastly the taxi to the southernmost point of the Trail. With a cloth bag over her shoulder holding her ‘shopping’, wearing light shoes and baggy Capri trousers, several layers of shirts and jackets and off she set. Emma often slept out in the open, making a bed from a pile of leaves and sometimes stayed with people on the trail, with a bath and supper, with a bed and breakfast. This was 1955 and she had only $200 with her, which went a long way back then. The ‘walk’ was easy at first although she soon encountered steep hills and then climbing up and then down some rough paths with no ‘white oblong’ signs to guide her. She vowed to do something about this fact as she lost the trail and had to backtrack many times. She traveled in this way for the 1205 miles till she reached the northern end of the trail taking months I believe, and rest breaks somewhere along the Trail. She is credited with saving the Appalachian Trail by reporting to whoever would listen, till something was done and many repairs and signs later, she started all over again. You have to read the rest of the story, it is such a marvelous achievement that Emma, as she walked all those miles, alone mostly. She did buy more substantial shoes and other outer gear as she was soaked to the skin sometimes and I am sure cold as well. Bill Bryson commented on her story “Emma was ill equipped and frequently lost”, yes and she was able to have that put right as she attempted another ‘walk’. I found this book while idly scanning books in the Senior Citizen’s store in Kennett Square with my son and daughter in law over Christmas. Not intending to buy any book, as I have many books already waiting to be read. But that title grabbed me and I started reading it, there in the store, in one of their comfy armchairs. I really enjoyed the achievement of this dear great grandmother, such an inspiration to us all, to put right what she found that was so abysmally neglected. Note: she didn’t walk away and grumble–she went back and persuaded the right people to repair and mark the trail properly again. Yes, several big achievements really. Happily reporting on this unique book, June Yeatman, long time member of School of Living. 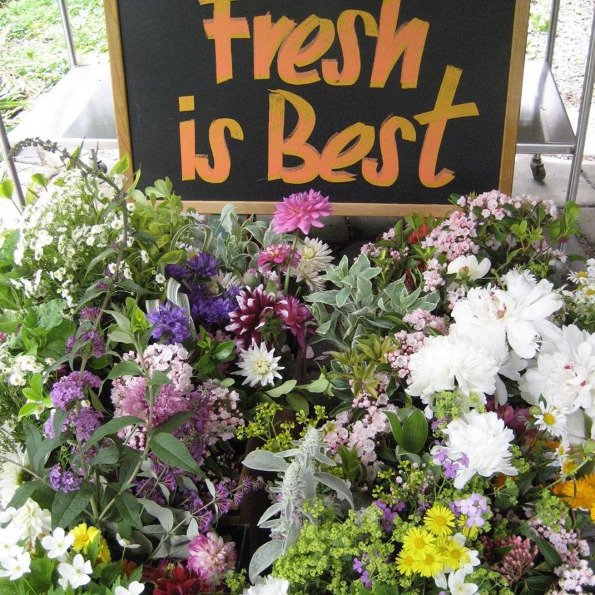 ​In February we had our second meeting in Harrisburg with the PA Cut Flower Growers Association. We had several guest speakers, including the PA secretary of agriculture. Part of the idea is to increase awareness that “Cut Flowers” is a real crop for a number of farmers in PA. Even though I have been growing cut flowers for over 20 years now, I learned so much from these 2 days with my fellow flower farmers! We welcome your involvement in and support of our work. Follow this link to become a member of School of Living.